In the late 1990's the Oadby Civic Society offered a redesign of the existing gardens on Burton's Corner as a tribute to the Millennium Year 2000. The design was considered by the Council and planning permission was granted. However this took longer than originally expected and the Millennium theme was dropped as it was no longer appropriate at that time. Initial work started in 2001 with the help of local firms. This included initial site and sculpture work as well as the initial grassing of the planting area, which was managed by the members of the Civic Society. It was felt at the time that the layout of the planted area should be carried out by a professional body and hence the Botanical Gardens in Oadby were approached. Barry Franklin from the Gardens took control of the layout and the selection of plants. Both the layout and covering of the grounds have been very successful. Leicester Racecourse, Oadby Furnishers and EAS Windows contributed towards the cost of the plants and they have all participated fully with the project. Invicta Plastics provided the majority of the on-site furniture whilst Pal International and the Rotary Club of Oadby paid for the benches. A lot of people use these facilities, especially when they are waiting for their buses or are just generally out and about enjoying the hustle and bustle of our busy town centre. A substantial financial contribution for the building works and planting was also provided by the Oadby Village Trust and Leicestershire Council Shires Fund, together with smaller amounts from both the Oadby Civic Society and other local companies. This area was finally re-opened in 2002 and since then it has been managed by the Oadby and Wigston Borough Council. The planting boxes were destroyed by vandalism but then replaced by the Oadby Rotary Club in 2004. 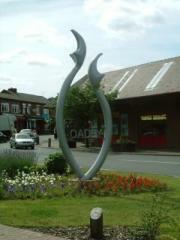 The sculpture was designed and erected by Alan Greenwood of Oadby Wrought Iron. At the outset there were wide ranging opinions about its design, however, it is now generally admired by the people of Oadby and it gives a unique identity to the town.